Street food has always been my favorite food. When Preeti wanted to do Street Food for Kid’s Delight, I was only so glad. I can again indulge in my favorite food. I was waiting for the weekend to come so that I can make these. I had selected something else and finally ended up doing something else. From Potato Chat to Aloo Tikki Chat. Well you may ask what’s difference only here you end up making the tikkis and then a chat with it. One big thing you can experiment in chats is the fact that you can make it and twist it as you like. Though my boys are yet to start liking these sort of dishes, Konda loves and I surely have a person who never says no for Chats. So I wanted to make sure I make it for her evening snacks. Oil – as required for deep frying. In a bowl, mix the corn flour with water and salt. Coat the patties in corn flour mix all over and then coat with bread crumbs. Heat oil for deep fry. Gently drop the tikkis and fry on all sides. Once you make the tikkis, freeze them so that they hold their shape. 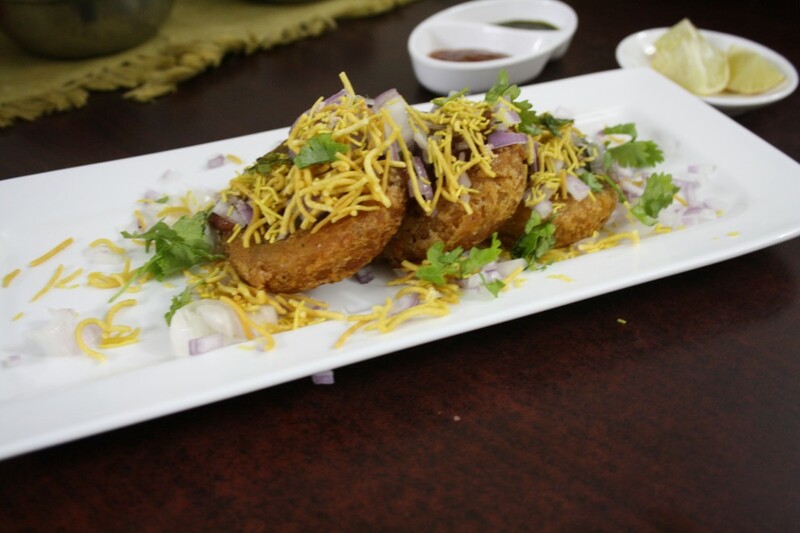 And also you can fry using oil just enough to cover the tikkis. In the serving plate, place the aloo tikkis, pour a teaspoon of green chutney, meetha chutney, Sprinkle kala namak, chaat masala, onions, next sprinkle the coriander leaves, finally with Sev. Needless to say this was so yum! Lil Angel loves chaat and I prepare non spicy version for her. Its always nice to have takers for our experiments:). 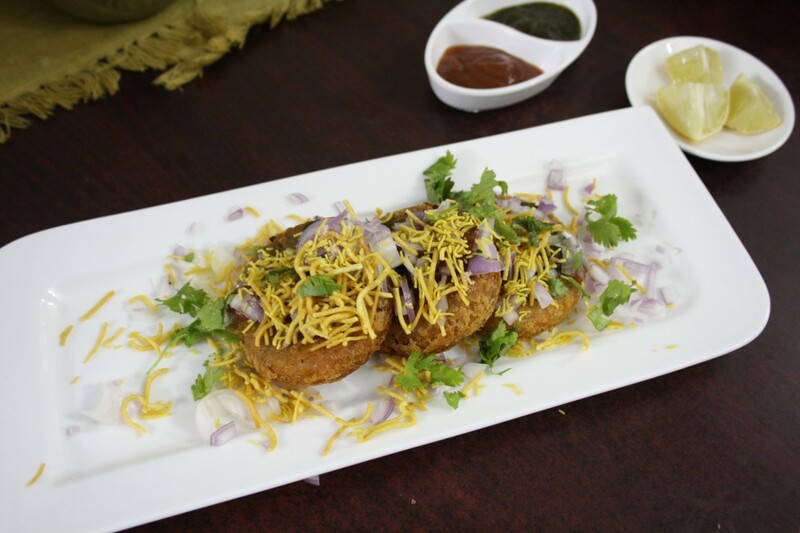 Love chaat foods very much, very irresistible aloo tikki chaat. looks so appetizing…wish I could try one right now! Irresistible chat…. love them with piping hot chai!! Very appetizing chat.making me want some right now!!! 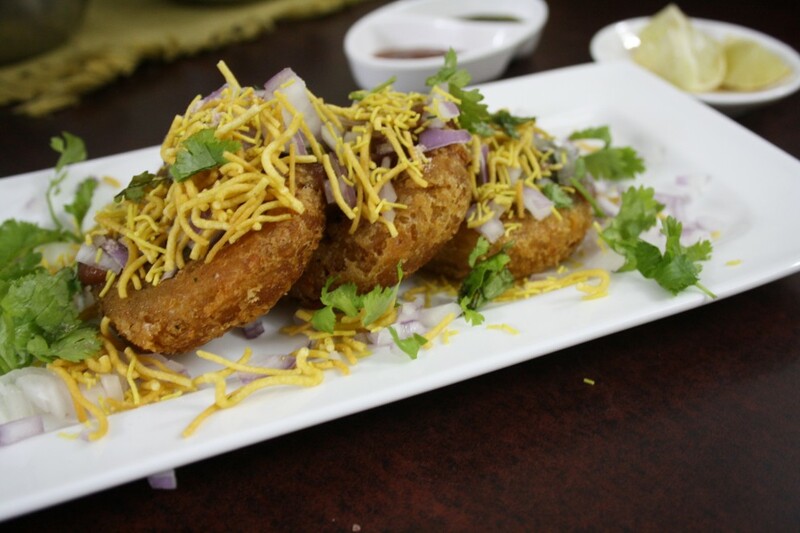 wow!..as yet when I am Delhi my first trip is to the chaat wala..and I am famous for eating tikkis!..like the crunchy sev on top! Valli, wow such a delicious and mouthwatering dish. Looks awesome. Haven't tasted this before. Aloo chaat is my all time favorite street food. this post brings back so many childhood memories of waiting in the streets to get this and hearing the noise that the chaat wala makes with his karandi! Nice presentation Valli. Am sure this is the fav one for many including myself!! Those aloo tikkis look awesome.. So flavorful and delicious. It is my hubby's favorite dish.